ALBERT CADABRA: The Great Deceiver! A master of illusion and charm, Albert Cadabra is an award-winning comedy sideshow magician who conjures astonishing and devilishly wild magic. Pushing and twisting the boundaries of the art of magic, Albert is internationally known for his unique performances; you can see him eating a dinner of razor blades and washing them down by swallowing a 3 foot long balloon whole, hammering 6 inch spikes into his face, electrocuting himself with 2,000 volts of electricity and transforming his assistant into a gorilla. He is capable of vanishing people and animals at will, and is an expert at escaping from chains, shackles, locked crates and straight jackets, even while strung 40 feet in the air by his ankles, only held safe by a flimsy bit of rope. All this and more, Albert delivers with unmatchable style, class and his inviting sense of humor. 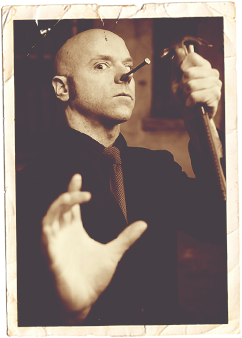 Born in Santa Monica, CA, and raised in Rhinebeck, NY, Albert was bitten by the stage bug in 1989 when Rhinebeck High School English teacher and Theatre Director, Vincent Nugent, took Albert under his wing and taught him to hone his magical class clown attitude into a creative and entertaining theatrical mindset. That year Albert went on to win the County Players Annual “Tony” Award for Best Supporting Actor in a Musical and Most Promising Male Talent for his role as the Scarecrow in their production of The Wizard of Oz. Albert has been on the stage ever since. He then went on to attend Bard College, receiving a B.A. in Liberal Arts with a Major in Film & Theater. Upon graduation he decided New York City was the place to make his new home, so he bought a one-way ticket and arrived during the blizzard of ’96 and has never looked back. Cadabra took to the NY stage immediately and in 1999 won the Funniest Person In Manhattan Award at the Stand-Up NY Comedy Club. In 2001 he then went on to produce, write and star in a 3-year Off-Broadway magic show called Magical Madness. 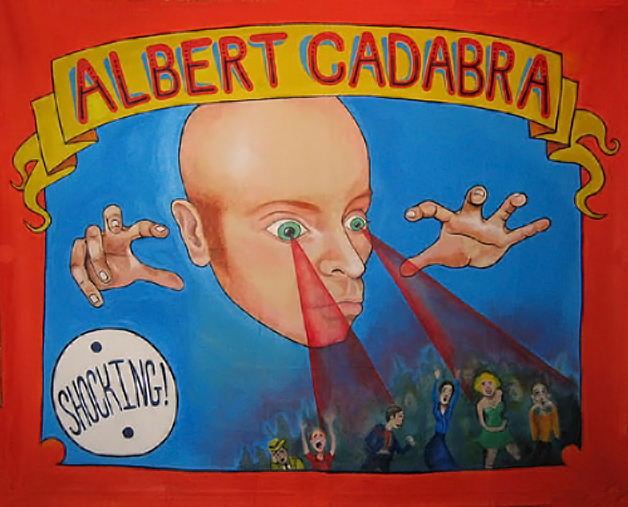 In 2005 Albert created a new show called The Cadabra Spectacular, which opened at Foxwoods Casino in Connecticut. It’s a 60-minute, fast-paced, high-energy show which combines his unique brand of shocking magic, stage illusions and of course Cadabra’s great sense of humor. Cadabra then created a late-night cabaret show in 2006 called The Skullduggery & Skin Show, which opened at the Palace of Wonders in Washington, DC. It is their longest-running and most popular monthly show to date! The show can be seen on the first Saturday of every month! It’s a 90-minute, high-energy variety show filled with Cadabra’s twisted magic illusions and sideshow stunts, as well as classic burlesque routines performed by NYC’s hottest burlesque stars! The show also contains a performance by the world’s most dangerous daredevil doggy, Ruby the Wonder Dog, winner of Most Talented Dog at the 2009 Barking Beauties Contest in NYC! In 2008 Albert signed a deal with Ripley’s Believe It or Not in Times Square to create, perform and host Ripley’s Sideshow Wonders, a daily, live, family-friendly sideshow with performances of the strange and bizarre. Since then, Ripley’s has gone on to recreate the Times Square Sideshow Wonders in other locations such as Myrtle Beach and London.